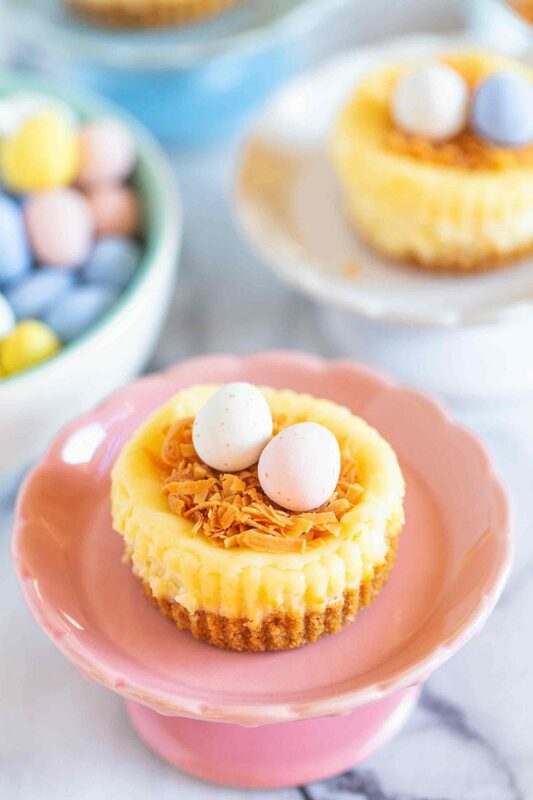 How cute are these mini cheesecake nests?! The perfect little treat for Easter! I’m obsessed with the chocolate speckled eggs. I get a bag each year around Easter time and now they have a DARK CHOCOLATE version. I have a bowl sitting on our ottoman right now and I’ve almost gotten to the bottom of the bowl. I’m thinking I’m going to have to get another bag before Easter comes and goes! 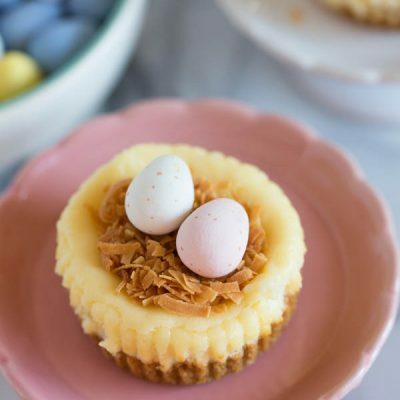 These mini cheesecake nests are super easy to make and you can get the kiddos to come help you decorate them after you’re done! I think the toasted coconut for the ‘nest’ is simply adorable. 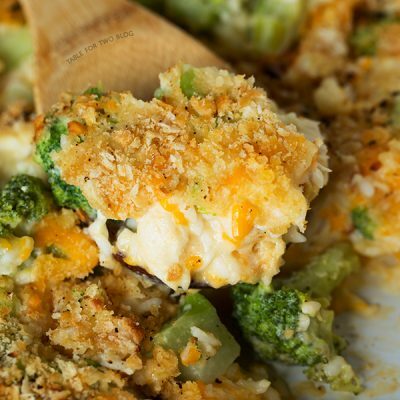 Can I make these in mini muffin pans? You can but I think it would make a lot and would be harder to decorate. 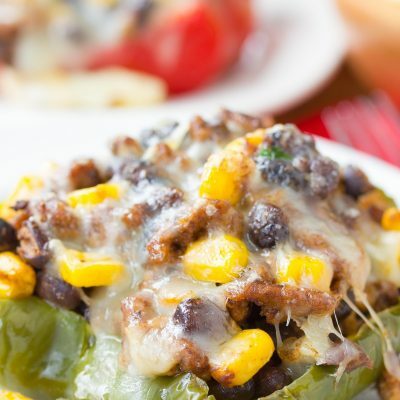 How can I make these dairy-free? I’m not familiar with dairy-free baking so I’m not sure! My cheesecake tops are cracked. My cheesecake tops are sunken in. That means the center hasn’t completely baked through yet! How can I tell if these are done cooking? If you shake the pan gently and they don’t really jiggle/move at all in the center, then they are done. What if I can’t find the chocolate eggs? You can use other chocolate candies! What if I can’t find already toasted coconut flakes? You can toast them yourself in a skillet on low heat or use a toaster oven. 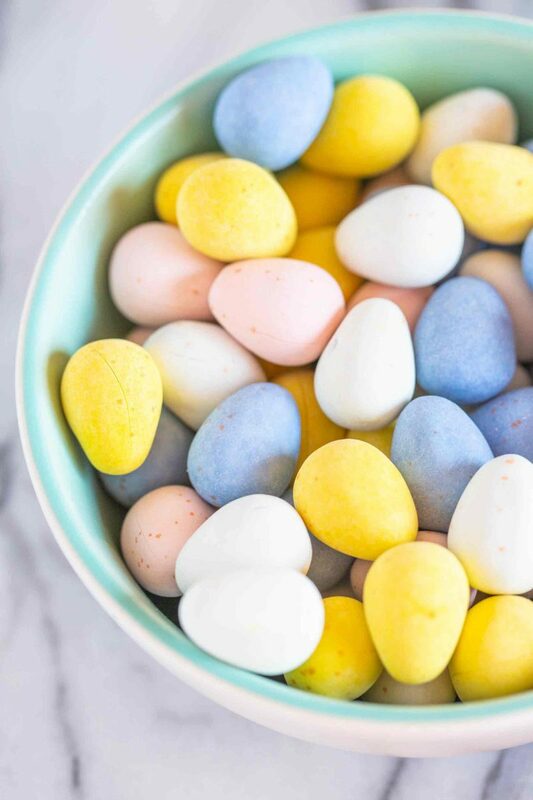 These are perfect for Easter and a great activity to do with the kids! Preheat oven to 325 degrees Fahrenheit. Line one 12-cup muffin pan completely with muffin liners and line half of a second 12-cup muffin pan with muffin liners so you have 12 lined cups in one muffin pan and 6 lined cups in the other muffin pan. In a medium bowl, mix together graham cracker crumbs, 2 tablespoons sugar and melted butter. Evenly divide mixture amongst the muffin cups and gently press into the bottoms of the muffin cups. In the bowl of a stand mixer or using a hand mixer, beat cream cheese, vanilla, and remaining sugar until smooth. Add eggs, 1 at a time, mixing on low until just incorporated. Spoon mixture over the crusts. Bake 25-30 minutes, or until the centers are just set. Cool completely then refrigerate for 2 hours. 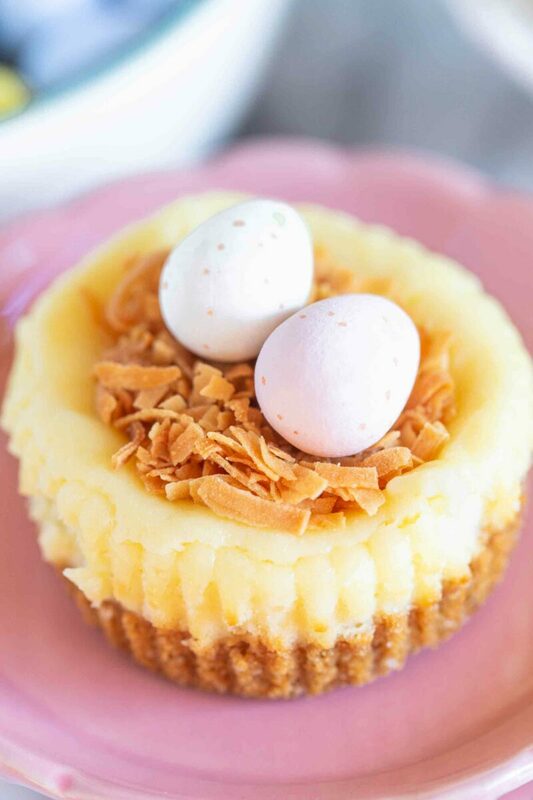 Top each cheesecake with toasted coconut flakes and chocolate eggs. *Nutrition facts are an estimate and not guaranteed to be accurate. And these nests? I CAN’T HANDLE THE CUTE. Cheesecake is my fav, but CUTE cheesecake? Dead. Pinned! The sore feet were totally worth it! Best viewing of the monuments ever… and great company. ;) These cheesecakes are seriously the cutest!! The kids would LOVE them! What a nice Easter treat! Adorable!!! 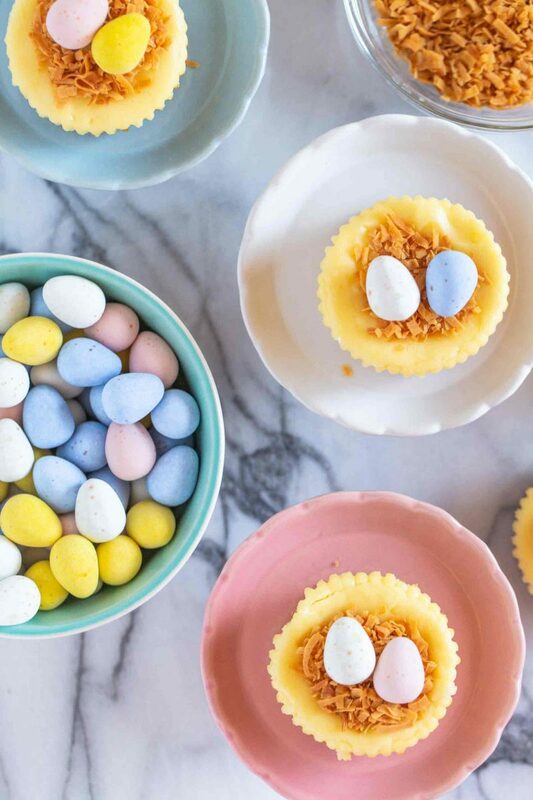 Love these fun Easter-y spring desserts!! Such a fun Easter themed dessert. Well, I would eat them anytime of year. Too cute! How cuuuuute! And my sister was in DC this weekend, too. The weather looked absolutely gorgeous. Hope you had a great time! eeee these are so adorable! i love all things cheesecake AND the cadbury mini eggs are definitely my downfall this time of year! These mini cheesecake are too adorable! Swoon! These are so darling! I love how festive they are! This may be silly but in Step 2 I’m just missing that the graham crackers are supposed to be in the mixture for the crusts, right? Cute? Beyond cute & these treats look soon very tasty!! these are absolutely adorable Julie! These little cheesecakes are adorable! these look so delicious, omg, I love them! 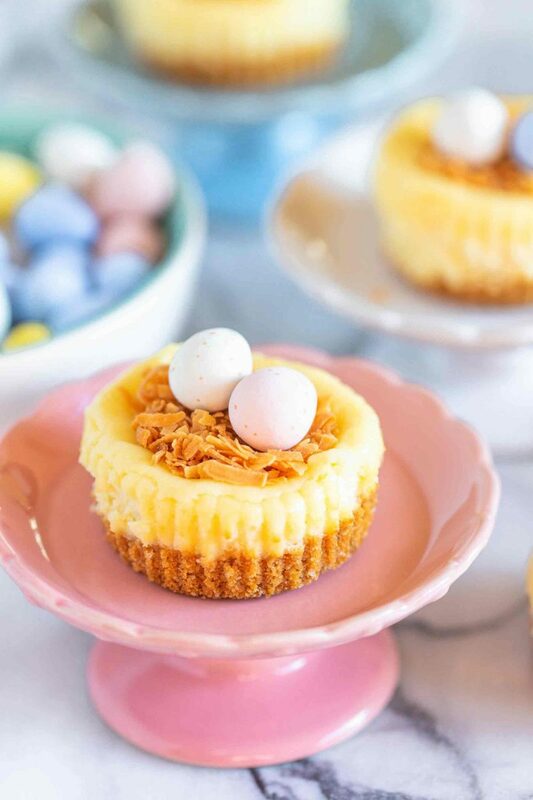 Julie, these mini cheesecakes are equal parts adorable and delicious! I absolutely adore the little birds nests you made from them! These are so darn CUTE Julie! The first time I saw the monuments was at night, and I’ve never ever forgotten it. What a great trip! Hi Julie, I really enjoy all of your recipes and these cheesecakes are adorable. For planning purposes, you say to line two 12-cup muffin pans, however, the recipe states it serves 18. Again, I am only asking for planning purposes. Thanks for your recipes. Hi Glenna, thanks for the message. I’m glad you enjoy all my recipes. Thanks for pointing out the mistake. I should probably clarify that you should line a full 12-cup muffin pan and then line a second 12-cup muffin pan but only half of it. I’ll go on and correct that now so there is no confusion. Hope you enjoy! How adorable! Perfect for Spring!! love these Julie! everyone’s said it already but for reals, these are beyond cute! These are so cute!! And perfect for Easter! Beyond cute and perfect for Easter, Julie! Loving your simple but very effective styling and photography here. So inviting for spring! Thank you for sharing and enjoy the rest of your week! P.S. Yes, monument viewing at night is best! Just made these for Easter. Total disaster. Anyone planning on making these, start checking around 8 minutes. I rotated my pans around 15 minutes and they were already set, but idiot I am I trusted the recipe and ended up with cracked, sunken, over baked junk. Not blaming blogger, but the recipe itself. Hi Jennifer – so sorry they didn’t turn out for you. I just can’t think of a reason why they’d be that way. 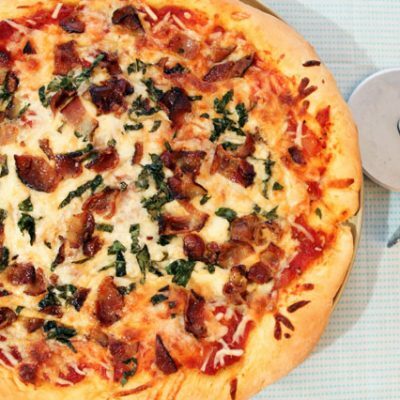 At 8 minutes there is no way it would be done at 325 degrees Fahrenheit. Did you fill them up almost all the way? If they were sunken, it’s because the middle wasn’t cooked so that’s why they sank. The batter is slightly thicker than other cheesecake recipes; was yours that way? Anyway, that’s a bummer they didn’t work out for you. 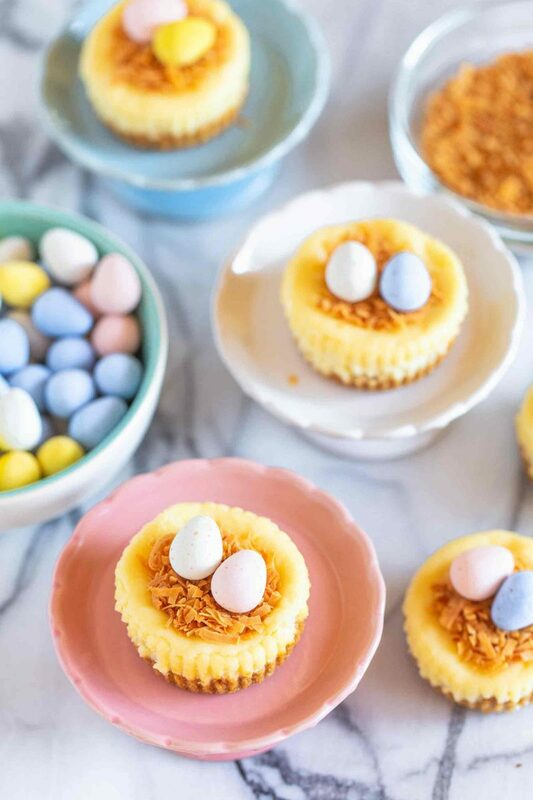 These are ADORABLE, and definitely making their way to my Easter menu! !